Finding the right vehicle tracking solution can be extremely daunting, there are so many products and options to select from and the reporting behind the scenes is frankly complex. Getting to the right choice is extremely important, and with the contract terms applied by many Companies, you don’t want to make the wrong decision which lingers on for several years! Amber brought to you by Viezu Technologies Ltd offers intelligent, insightful and yet affordable tracking which is contract free, and once you have purchased your tracking device your only ongoing commitment is to your SIM communication. The tracking is accessed through an App available from iOS and android. To enjoy the features available you first need to purchase a SIM card to enable the communications on the device. All major SIM card telecommunication providers are compatible with the devices including Vodafone, EE, and O2. This means the monthly cost for your SIM card can be as little as £2.50 for data only services*. The Tracker is controlled entirely from the App meaning data usage from the SIM is minimal. 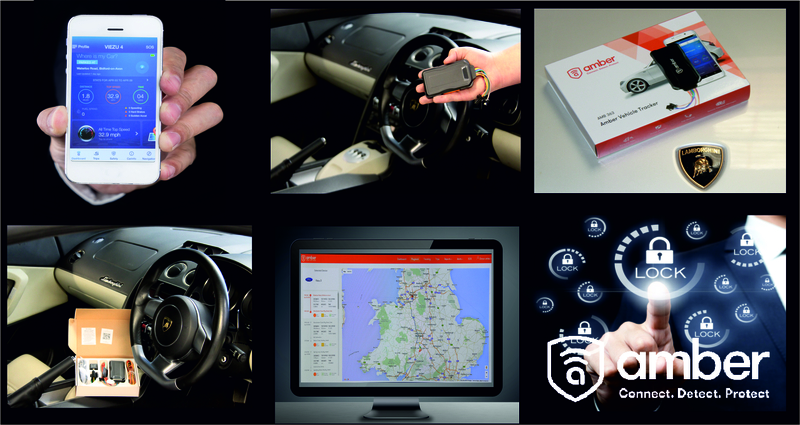 Amber offers a number of smart devices that allow you to stop/start a vehicle via the App (yes you read that right!) as well as listen in to the vehicle, negating the need for the purchase and installation of extra microphone hardware. There is the usual annual license fee and, guess what, it’s less than £40.00 per year! There are no hidden fees either for reports or anything else – Amber Connect is a no-brainer for Business or Personal tracking. It’s simply affordable - allowing you to maximise efficiencies or to simply Connect, Protect and Detect. Amber smart devices are incredibly diverse with the ability to apply the tracker in either wireless or hardwired format to the engine. Wireless devices can of course be moved from vehicle-to-vehicle.